– Click on Form Setting on Nintex Form designer screen. – Subsequently, I published the form. – Now, when I try to add a new item in my custom list, it opens Nintex Form and I get the error given below. Once I clicked on OK, the list form closed and default list view was displayed. Hence, I thought that maybe my Nintex Form for Office 365 app was outdated. I searched how to update Nintex Forms for Office 365 app. I found so many links but I found that my Nintex Form is up to date. Thus, it gave me trouble. I kept on searching. Finally, I found the solution. When I found the solution, I was really disappointed with Nintex Forms error message, as it is misleading. What did I do wrong? I wrote the wrong syntax. Instead, write the code given below. The only mistake was I missed the semicolon (;) and I got this error message. I corrected the code and everything was fine and I got an alert message with “Hello”. Thus, I thought of sharing this, because the error message is somehow misleading in finding the solution. Thus, when you get the error like this, then do the checks given below. It saved my time to a phenomenal extent. I hope, this will save time for others also. If you have any query regarding this or you need more information, please feel free to ask in the comment section. HostForLIFE.eu’s SharePoint 2016 Hosting solution offers a comprehensive feature set that is easy-to-use for new users, yet powerful enough for the most demanding web developer expert. Hosted SharePoint Foundation 2016 is the premiere web-based collaboration and productivity enhancement tool on the market today. With SharePoint 2016 Foundation, you can quickly access and manage documents and information anytime, anywhere though a Web browser in a secure and user friendly way. 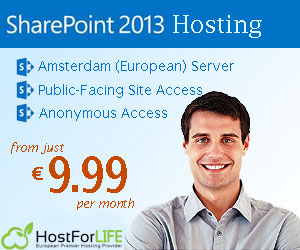 SharePoint hosting services start at only at €9.99/mo, allowing you to take advantage of the robust feature set for a small business price. HostForLIFE.eu offers a variety of hosted SharePoint Foundation 2016 plans as well as dedicated SharePoint 2016 Foundation options. SharePoint 2016 provides diagnostic logging services to debug and isolate the issues among the farm. we will configure it from monitoring section in Central Administration. As part of it, we will specify the situation wherever the trace logs are going to be stored. In production, it’ll be a decent plan to stay it in a high capacity disk. Once logging has been in place, it’ll produce the log files in real time, depending upon the severity of the events. we will go to the log location and find the recently updated log file to work on an existing issue in the farm. However, opening it up in a notepad is going to create a tough time isolating the error as it is flooded with event logs. To alleviate this issue, we can make use of a log viewer. There were many log viewers available for SharePoint 2013, however, not all of them are reusable with SharePoint 2016. One of the log viewers, intended for SharePoint 2013 but can be used with SharePoint 2016, is the ULS log viewer from Microsoft which can be downloaded from here. ULS stands for Unified Logging Service. Once the log viewer is installed and opened, it will ask for the log file location from which the log files should be picked up. Specify the log folder path and click on OK. This will load the logs into the ULS log viewer and we can easily browse through it to isolate the issues. We can also find the issues by severity. Clicking on the severity icons in the top menu bar will highlight the issue accordingly. Critical issues will be highlighted, as shown below. This helps to identify and pick the needed ones from the large pool of event logs. SharePoint 2016 Hosting – How to Disable Mobile Browser View Across Sites In SharePoint Server 2016? In this review, I will tell you about how to disable Mobile Browser View Across Sites In SharePoint Server 2016. Device channels were introduced in SharePoint 2013. Device channel allows us to map the created device channel to a device, based on its user agent and target custom master pages, specifically to the device. Thus, we can have one master page for iPhone while a different one for Blackberry and so on. However, when we try to specify a master page for the device channel, we will get the below warning if Mobile Browser view is not disabled. Now, we can disable Mobile Browser View feature across the sites in a site collection by running the below script in SharePoint 2016 Management Shell. $SPWebApplication = Get - SPWebApplication - Identity "http://SharePoint2016"
Now, Heading over to the Features section, we can see that the Mobile Browser View has been disabled. SharePoint 2016 Hosting – How to Check If a User Has a Specific Permission Level in SharePoint 2016? Role definition, additionally called a permission level, is that the list of permissions, related to the role. Full control, contribute, read, design, and limited access are some of the role definitions available. Role assignment is the relationship established between users/groups and the role definition. Now we can add the above code in the Content Editor Web Part to see it in action. Specify the URL of the text file containing the JSOM Code in the content link field. Upon clicking “Apply”, we will get the output in the console, as shown below.